Spots before our eyes. The daily pinta making its daily pilgrimage. You don’t have to be in the entertainment world to know that timing is everything. The Dog and I normally go down into the village, turn right by the pub and climb up the hill past the school. Should we miss-time our morning outing we could find ourselves stuck behind the herd of cows as they make their way from the farm to the fields. This is not a pleasant situation to find ourselves in. Did you know that your average cow produces up to ten tons of manure each year? Sometimes, when we get stuck behind the herd we are convinced that they have chosen today to produce it. They really are messy animals. Getting caught ahead of the herd is not so bad. 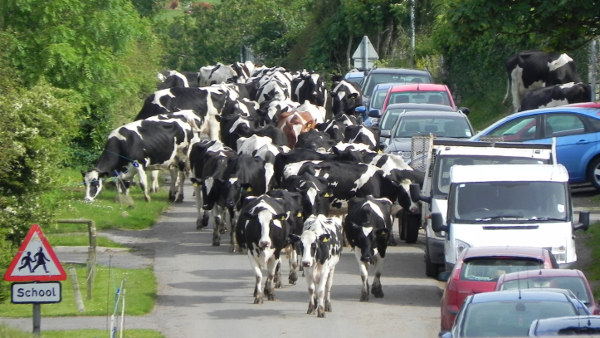 Cows generally don’t seem to be in too much of a hurry – they’ve got all day I suppose. As a general rule The Dog and I can outpace them easily. The Farmer walks ahead of them calling out to them and they saunter after him – taking their own time about it. I don’t think they actually need him out the front at all – they know the way to the fields – but they’re a kind hearted bunch so they don’t push the point. As you can see from the picture, today we were ahead of the game and when we reached the T junction we stopped to watch. Just at the back of this picture, so to speak, the road has little or no verge and quite high hedges, so here, just opposite the school where the lane broadens, the herd spreads out. As far as I know, no-one has had their car eaten yet. Another Unidentified Flying Object spotted over Cumbria. Could we be in the English Area 51? RAF Spadeadam is just around the corner from us you know, but this was more than just a Blue Streak. The Dog and I were wending our weary way homeward yesterday when I heard a strange cry. Looking around I spotted a large bird, looking a bit like a sea gull, flapping slowly past a few fields away. I normally tuck the camera inside my jacket when we are out and about – it stops it swinging about and irritating me and it also keeps it reasonably dry. It does mean though that, in times of emergency or anything requiring a quick pic – it is first necessary to disentangle the camera strap, my jacket lining and the lens cover, switch the camera on and try to find where whatever it was that prompted us into hectic action has gone to. This time, we managed to complete the above procedure and locate the bird before he disappeared into dim and distant parts – and take one picture . 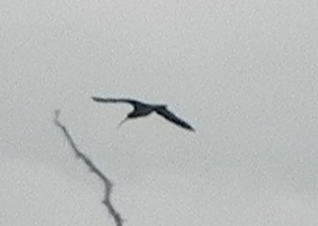 And here it is – we think it’s a Curlew (or a Whaup). Google thinks that they live on estuaries and mudflats. Well, we do live near an estuary and with the rain we’ve had recently most of the fields around here could be mistaken for mudflats. Where have all the flowers gone? Where do all the flowers come from? We’re talking about men’s faithfulness here – we’ve got a birds eye view. It just doesn’t last so just leave it alone. We just need a bit of sunshine. Veronica Chamaedrys – she sounds a bit like a foreigner doesn’t she? Like everything else, she is originally from Northern Turkey. Those early plant hunters must have ripped up every plant they could find and come rushing home with it. I think there was big money in plants in those days. You can’t imagine anyone being allowed to introduce a foreign plant into the country these days can you? And yet we owe so much of the colour that sprinkles our countryside to immigrants and imports. 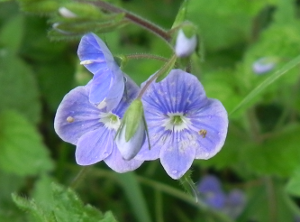 Germander Speedwell (Bird’s Eye Speedwell) is what we believe is in this photo. Like the vetches that we’ve complained about previously, there are too many varieties that you need a microscope to tell apart for our taste. For goodness sake! If you can’t easily see the difference then it’s the same damn plant! We have enough trouble because people call the one flower by a load of different names – we don’t need all this complication. Speedwell is not, as you may think, to do with parting, it’s because the flower wilts very quickly once it’s been plucked. Speed wilt – speed well. It’s not as hard to imagine that that’s the correct corruption as it is to believe some of the other reasons we’ve been given to explain flower names. Männertreu it’s called in German – men’s faithfulness – a reference to the previous paragraph – probably been named this by a woman. 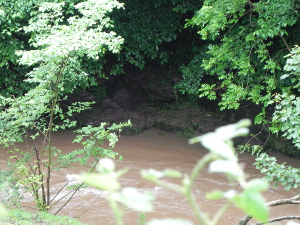 Our river, down at the bottom – just before the road rises again, up towards the main road – has been busy again. He’s had on his old brown dust-coat and been too engaged in his own affairs to talk to anyone. The banks, he decided, needed a good scouring, particularly that overhang that held the winter icicles. He is clearly a Feng Shui enthusiast and has calculated that, in order for the energy to be able to flow correctly, the place needed a good de-clutter. There was a half a tree, complete with leaves and flowers, that he had positioned carefully in the middle of his bed last time he had a big change around. It was obviously completely wrong. Now that the Solstice has come and gone it had to go. Earth and water are his elements – with a little wood thrown in for good measure – now and again. Fire and metal just don’t seem to fit in with his productive and destructive cycles, possibly due to the sleeping dragon or the relevant compass bearings. The Dog can peer through the flood relief openings in the bridge walls, especially contrived at a convenient dog height. She noted that, not only had the dragon missed his appointment, by being asleep but there were no ducks this time either. It’s official – the past is over! What’s done is done. Forgiveness does not change the past but it does enlarge the future. The past is a foreign country: they do things differently there. We are starting the future NOW. Here’s a piece of hedge that understands that the past is gone beyond recovery. Remember it, yes, we should, but we should not allow it to dominate our future. Dr Edward Bach [1886-1936], made it his life’s work to produce a series of flower essences. He used these essences himself in his medical practice. The Honeysuckle essence he used whenever his patient seemed to be stuck in the past. When the patient couldn’t move on, couldn’t get on with their life, and he felt that their malady was a result of this frustration. 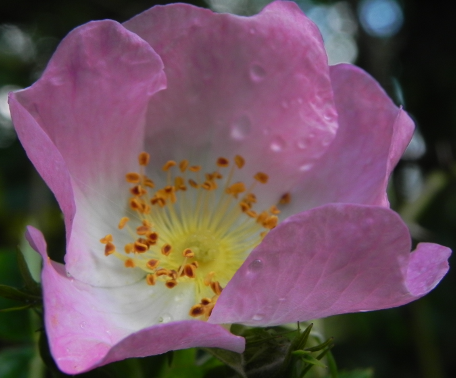 The Wild Rose essence was used to give patients who were sunk in apathy, who couldn’t see anything in their future – and who just didn’t care that they didn’t have a future. How apt that our hedgerows at the moment are bursting with Honeysuckle to give us all the needed push to force us to move on and let go of the past – and Wild Rose to help us to see that the future is where we want to be – and to go for it! Have you got animals in your life? Did you ever wonder what they thought of the strange association between you and them? Can you imagine a friendship between two totally different animals occurring in the wild? Is this what humans were put on the planet for? The Dog and I often have extended conversations on a variety of subjects. She tends to be non-committal mostly. I often wonder just how she sees our relationship. We see her as part of the family. Does she see us as part of the pack or, as she has no direct experience of living with a pack, are we her family? In a previous life, we had a dog and a cat. While they were very particular about their individual perquisites and insisted on the maintenance of the established pecking order, never-the-less we would often come home to find them sitting on adjacent steps of the staircase (a position that gave a good view of the front door), just keeping each other company while we were out. Sometimes, on our walk, The Dog and I come across the cows making the daily trek from milking shed to field. The farmer walks on ahead of the herd calling out to them – and all thirty or forty cows plod along behind him, following him into whichever field he has selected. This guy was a bit irritated as we passed the stables. Someone had come and saddled up one of the other horses and the two of them had gone off for a ride. It was plain that he felt it was grossly unfair that he hadn’t been chosen for the outing. 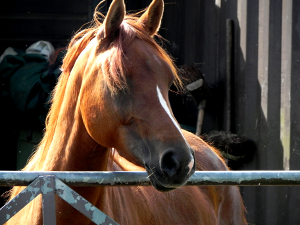 Horses seem to value human company. Do they see their riders as fellow herd-members – or is it something more than that, do they value human friendship? Are we here as mediators, protectors, carers or is there some deep natural instinct within us that drives us to commune with the animals around us? If animals don’t do this in the wild – is this actually what makes us different from animals?